What is Involved in Working At Heights Training? 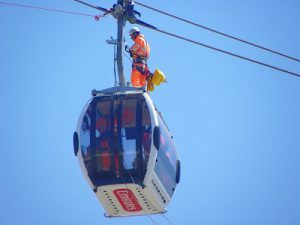 There are a variety of jobs that require employees to work from heights, this type of work poses some very unique risks and some significant dangers. Falls from heights still remain one of the main causes of work related injuries, disabilities, and death. Working at height training is aimed at reducing the risks of falls from heights by providing the necessary tools to help employees avoid falls. Working at Height training courses covers a variety of subjects that are designed to help those taking the courses to understand how such falls occurs, ways of assessing the potential risks and minimizing those risks to help ensure a safer work environment. In addition, working at height training covers working at heights using specific tools such as ladders and scaffolding. The course also covers fall arrest systems and how to use them properly. In many cases, work related falls from heights happen because someone over extends themselves when reaching for objects, or because they did not take the time to check equipment such as ladders and scaffolding to make sure that it was in good working order before attempting to use the equipment. Learning to check equipment that your safety depends on is the first step in eliminating falls. Worn scaffolding cables or loose ladder rungs pose significant dangers. Workers themselves need to be trained to work from heights, and need to understand how their own actions can result in falls. Employers need to be aware of the hazards of working from heights and be willing to reduce as many of those risks as possible. Ensuring that all employees who will be working from heights have proper training in identifying and avoiding risks, as well as how to safely use fall arrest systems, is an essential part in reducing the dangers of working from heights. ensuring that all workers and supervisors receive working at height training and obtain a certificate that you keep on file. Keep a record of identified risks and what your company did to reduce them. Make sure that your supervisors make periodic safety checks of equipment and that workers are following height safety guidelines and they keep a record of checks. By ensuring that your workers and supervisors are trained at working from heights you can reduce the number of fall related accidents, injuries and deaths and provide a safer and more efficient working environment that will benefit everyone in your company.